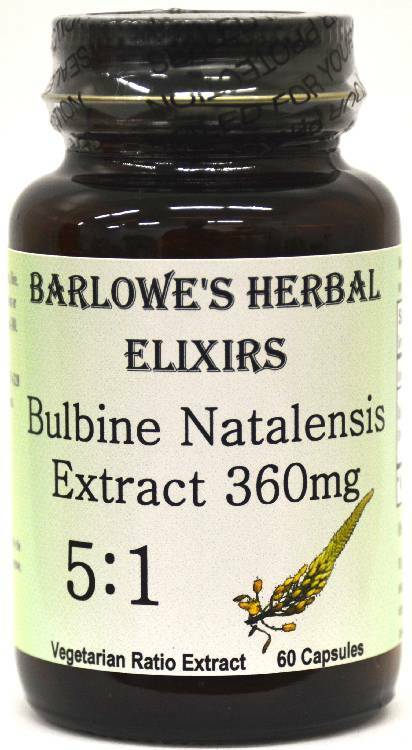 Barlowe's Herbal Elixirs now brings you a quality Bulbine Natalensis 5:1 Extract. Bulbine Natalensis, an herb native to South Africa, may in small dosages substantially and quickly increase Testosterone in humans, while at the same time reducing Estrogen levels. Bottled in Glass! No Stearates! No Fillers! No Junk! Barlowe's Herbal Elixirs now brings you a quality Bulbine Natalensis 5:1 Extract. 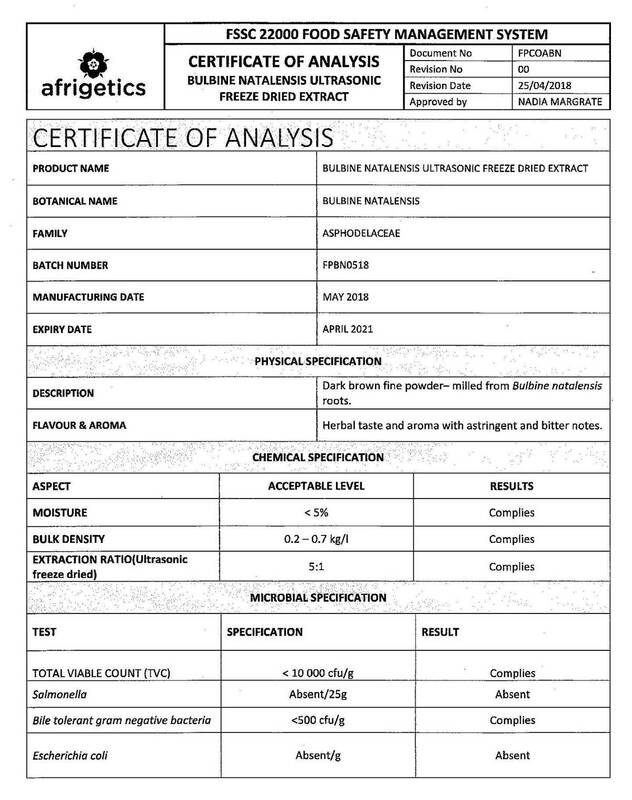 The Bulbine Natalensis Certificate of Analysis (COA) for this particular batch is shown above. Bulbine Natalensis, an herb native to South Africa, may in small dosages substantially and quickly increase Testosterone in humans, while at the same time reducing Estrogen levels. Bottled in Glass! No Stearates! No Fillers! No Junk! Bulbine Natalensis is an herb which has received a lot of attention in the past months. It appears to have great potential as a libido/Testosterone boosting supplement. Although there are several good herbal extracts for boosting Testosterone, Bulbine Natalensis seems to be the only one which at the same time lowers Estrogen levels. Even though several Bulbine studies are mentioned on the internet, the only published one Barlowe's has been able to find a link to is shown below. It is reported, however, that a rodent study performed by the Centre for Phytomedicine Research, Department of Botany, University of Fort Hare, Alice, South Africa found that rodents receiving Bulbine Natalensis water extract had on average a Serum Testosterone level equal to 347% of the control group that did not receive Bulbine, and that their Estrogen levels were 35% lower. A recent non-clinical study showed that a 36 year old male weighing 75 kilograms over a two week period taking 360 milligrams of 5:1 Bulbine Natalensis cold water extract increased his total and free Testosterone levels by 35.5%. The study linked to below found that Bulbine substantially increased the libido of male rats. Barlowe's Herbal Elixirs is offering this high quality 5:1 Bulbine Natalensis Extract in 360 milligram capsules. 360 milligrams appears to be a fairly standard dosage level. 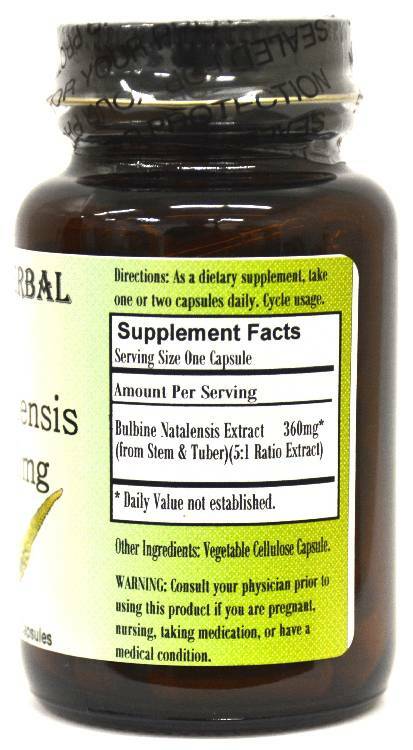 The capsules contain only Bulbine Natalensis Extract with absolutely no other adulterants or fillers. Bulbine probably should not be taken by those inexperienced with herbal testosterone boosters. Barlowe's is only offering this product in order that those interested may experiment with and test Bulbine Extract in its pure form. Caution: Barlowe's Bulbine Natalensis Extract is generally safe, but it is potent and should be utilized with care. Do not exceed one capsule daily until you have exensively tested your results using one 360mg capsule daily. However, some people will need two capsules daily. This product is for dietary use. If side-effects occur, discontinue use immediately! The above statements have not been evaluated by the Food and Drug Administration (FDA). This product is not intended to diagnose, treat, cure, or prevent any disease. Directions For Use: Take only one (360 mg) capsule daily on an empty stomach, unless you have a high body weight. Some people may need two capsules daily however. Cycle usage - for example, two weeks on, one week off. Less is more with this extract. Results follow a bell-shaped curve. Testosterone continues to increase up to a certain mg dosage, but if that dosage is exceeded, results may decrease. Results and usage amounts may vary based on body type and weight.